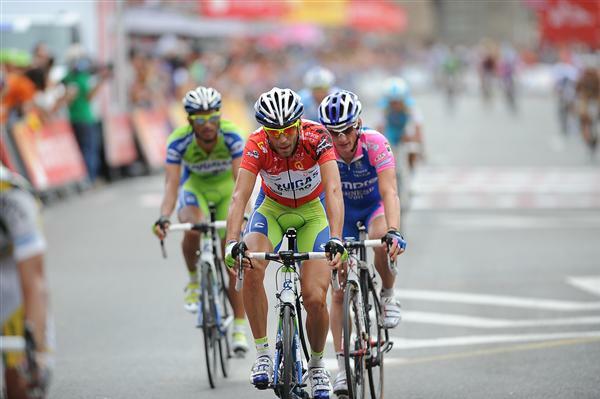 The 2010 Vuelta a Espana, wraps-up this weekend with its final two stages. Tomorrow’s Stage 20 looks to be arguably one of the toughest of the race, and with much still up for grabs—including the race’s overall title—expect fireworks. The battle for the Vuelta’s final red jersey has narrowed to two men following Wednesday’s Stage 17 time trial: Vicenzo Nibali and Ezequiel Mosquera. Nibali used his superior skills against the clock to effectively eliminate Joaquin Rodriguez from contention, and stole another 12-seconds from Mosquera with an attentive finish in today’s stage in Toledo. With 50-seconds in hand, Nibali—and his Liquigas team—will need to do all they can to tire Mosquera and his Xacobeo squad early, before leaving it all up to Nibali defend himself on the final climb up the Bola del Mondo. Roman Kreuziger will be Nibali’s key ally here. Rumored to be one of the strongest riders in the race currently, the Czech could play a vital roll in keeping Nibali—and his lead—intact. Behind these two, HTC’s Peter Velits looks all but assured of the final spot on the podium—making him the first rider from HTC to finish in the top-3 of a grand tour. Further back, six men sit within 34 seconds of fourth place— Rodriguez, Schleck, Tondo, Roche, Danielson, and Sastre. This impending battle for GC spots could help Mosquera as he’ll likely have at least one or two men willing to go on the attack; luckily for Nibali, he only has one rider to mark. Before the race, I picked Nibali to win, so I’m going to dance with the one I came with. But you can never doubt an aggressive Spaniard on the second-to-last day of his home tour—Mosquera could pull it off with an aggressive ride up the Bola. As for Sunday’s Madrid promenade, look for Cavendish to take his fourth stage win of the race—if he doesn’t give it to his talented lead-out man, Matthew Goss. In other continental action, Italy hosts two events this weekend: Saturday’s GP Citta Modena – Memorial Viviana Monservisi and Sunday’s GP Industria & Commercio di Prato. Both races feature the usual mix of Italian racers and teams, with few major names to report. In the end, look for Liquigas’ Francesco Chicchi to take the win Saturday and Italian Champion Giovanni Visconti to score a repeat win for ISD-Neri. In France, Sunday brings one of my favorite autumn races, the GP Isbergues. As expected, the bulk of the race’s start list is populated with French riders and teams—of these, BBox’s Thomas Voeckler and Vacansoleil’s Romain Feillu appear to be in the best form. But challenges will come from several others including Rabobank’s Paul Martens, Katusha’s Sergei Ivanov, and BMC’s Alessandro Ballan. In the end, I see Bjorn Leukemans taking the win—he’s riding well, he’s performed well here in the past, and he could use a victory to justify the squabble he started with new teammate, Ricardo Ricco. With Feillu, Mancato, and Ricco on the roster as well, Vacansoleil has several cards to play. And let’s not forget the Tour of Britain. HTC seems assured of the overall victory with Micheal Albasini; tomorrow’s criterium could Andre Greipel another victory–and his last in an HTC jersey? Last, but certainly not least, the US Pro Time Trial and Road Championships take place this weekend with just about everyone taking part (save a few men currently racing the Vuelta). On Saturday, look for Kelly Benefit Strategies’ Scott Zwizanski to hold-off Radio Shack’s Levi Leipheimer and Taylor Phinney for the win. That’s a tall order indeed, but I suspect Levi could be looking ahead to Sunday and Phinney’s a little tired from the recent Tour de l’Avenir. In the road race, while upsets are always possible in events such as these, I expect Leipheimer, his teammate Chris Horner, and defending champ George Hincapie are the men to beat—with Hincapie a suspect choice following his crash at the Tour of Utah. For an outsider, look no further than Andrew Talansky, the recent runner-up at the Tour de L’Avenir. In the end, I think one of the Radio shack boys takes it—particularly if Leipheimer underwhelms in the ITT 24-hours prior. That said, the biggest drama in Greenville just might take place off the bike, as several riders taking part are rumored to be on the list Joe Papp has supposedly given to USA Cycling of riders to which he sold drugs. As information leaks, expect to see some interesting last-minute non-starters. So there’s a quick rundown of this weekend’s events. Who are your picks? This entry was posted in Races and tagged france, gp isbergues, italy, nibali, spain, us pro championships, vuelta a españa. Bookmark the permalink. a bit late for a prediction – other than Nibali will win more grand tours. Of more interest to me is the transfer season. I like the idea of Brice Feillu joining Schleck bros; especially his attiutade to being a domestique with the occassional freedom. Maybe the sponser has some ties to France? Any ideas who else may sign on – Spartacus presumably? I was intriqued to read that Riis was negotiating with Contador during the tour. Does that explain in part some of the poor tactical decisions Saxo Bank seemed to make (e.g., Andy Schleck not continuing to attack Contador on stage 17 to the Tormalet)? Oh yeah, I love a good conspiracy theory!